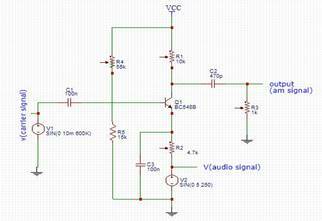 In this project, we implement a radio transmitter and receiver that makes use of amplitude modulation for the transmission of the given speech signal. The frequency of the carrier has been adjusted as 600KHz and the message signal transmitted is in the human voice frequency range. Modulation refers to the technique in which modification of any parameter of a carrier wave is done, in accordance to the amplitude of the signal to be transmitted. 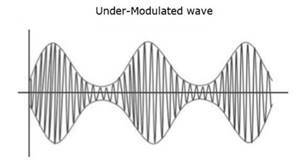 The earliest form of modulation is amplitude modulation, in which the amplitude of the carrier wave is varied with the amplitude of the data signal. This broadcasting technique is currently used in the transmission of spoken-word formats such as talk radio, news etcetera. AM, when compared to other modulation techniques such as FM and PM, is more susceptible to interference and has limited audio fidelity and hence, it finds applications in transmission of speech signals. m(t)= Amcos(2Ï€fmt), is the message signal. where Amax and Amin are the maximum and minimum amplitudes in the modulated wave. If a modulated wave has a value of Âµ<1, the signal is called an under-modulated wave. A value of Âµ>1 produces an over-modulated wave that causes interference and ultimately, loss of information and hence, the value of Âµ should always be maintained less than one. Fig. Over-modulated wave ( Âµ>1) tracing of the signal. The modulator used for the experiment is known as an emitter modulator ,which makes use of bipolar junction transistors for modulating the input signal. It operates in class A mode but the output obtained is small in magnitude and hence, it cannot be implemented for applications that require high range transmission. One of the biggest advantages of an emitter modulator is that it is simple to construct and require very low power for operating. The input signal applied is a sinusoidal wave of frequency 250Hz and the carrier used is of frequency 600KHz. Therefore, bandwidth= 2fm. In the experiment, the bandwidth required would be in the range 170Hz to 510Hz. The radio transmission system built makes use of the most primitive form of modulation i.e. 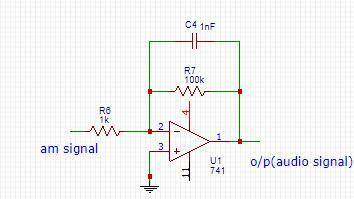 AM modulation for transmission of audio signals and hence, the range that could be covered by the system is low. Also, the data that can be transmitted using this system is confined to human speech signals, due to the limited noise fidelity of the system.